Passion for music and drive to succeed took Derek from performing Aerosmith’s “I Don’t Want to Miss a Thing” at age 3 for family to now having performed over 350 shows in four years. Born in the small town of Scituate, Massachusetts in 1995, Derek moved to Florida at age 3. He grew up listening to all of the greats, from legends like Aerosmith, Tom Petty, and The Eagles to Michael Jackson and Garth Brooks. “I grew up on all kinds of music. From classic rock, pop, country, everything! You got to remember I’m a 90s kid too so even the Backstreet Boys and Shania Twain have influences in my music.” Derek attributes many of his stage antics and sound to the various musical influences he grew up on. After graduation, Derek moved to Nashville to further his career in the Music Business. 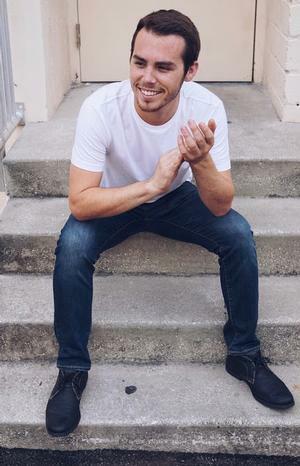 After spending a year in Nashville working at iHeartRadio, he moved back to Bradenton, FL in 2017 to continue working in the entertainment industry and continue his music dream.